Sheer Ullah Wajid (38yrs) belong to Nagar valley was joined Saiyah as assistant mountain cook in 2008 but his passion to climbing mountains always haunted him while he was going on with different mountaineering trekking/expedition as member of cooking team, he asked himself will I be able to put my feet on spectacular mountains like Rakaposhi, Diran, ultar sar, SPANTIK or Golden peak which surround his valley. He got first chance by chance when he was with Japanese’s who intended to climb the Mingling Sar “Sir I will go with You” and then jubilant news came they summited. Getting specialization in cooking from Japan in 2009 and 2010 never being able to wither the lust of climbing and waiting for the days to be on 7,000m than 8,000m, in 2014 a Japanese’s climbing team came on mountaineering expedition for Spantik 7,028m. He was accompany with them as a cook on his request and looking the zeal and zest Saiyah managment gave him the permission to climb. 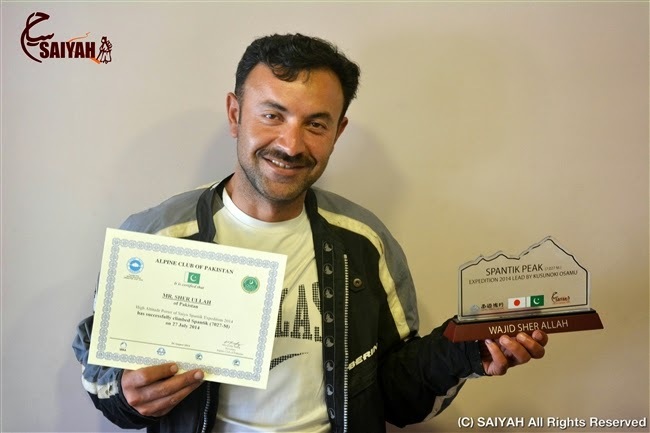 On 27 July 2014 at 06:00 he put a milestone in his climbing carrier by giving a call of his summit from the top of Spantik & became the first climber from Nagar Valley on Spantik. Now his eyes are on 8,000m.